The Daily Float: Spring Dry Fly Fishing on the Bitterroot river! Spring Discount! Spring Dry Fly Fishing on the Bitterroot river! Spring Discount! Skwalla stone flies are coming off my tying bench at a pretty decent rate. Soon they will be bobbing down the riffles of the Bitterroot river here, along with ample amounts of naturals. It's no secret anymore, and the chance of taking wild trout on a size 8 to 10 dry fly draws some well deserved attention. 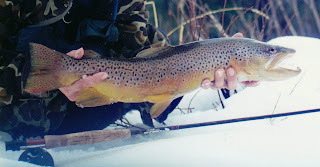 Pretty hard to resist throwing "hopper" sized dry flies in early March and on into April. On the right year, with the right conditions, we even get to fish into May for a week or so as well. Mid-March to mid-April is traditionally the safest time to plan your trip. Those willing to brave the chance of rising water, and an escape route over to the Missouri, will venture out in late April and early May for a chance at some of the most incredible dry fly action of the season! Believe me though, when high water hits this time of year, it hits hard. You can go from two days of throwing nothing but drys on the Bitterroot and "killing 'em", to a two and a half hour drive and strike indicators, in twelve hours or less! Oh well, we live for this chance of incredible dry fly fishing, after a long cold winter, a better cure for the "fever" there is not! The Skwalla hatch is one of the best times to take a Monster Brown on a dry here in western Montana. A little different than your average stone fly, as the females enjoy crawling into the water in great numbers on the cloudy, overcast days to deposit their eggs. From crushing strikes that may splash water on the side of the boat, to the giant nose sliding over your low profile imitation, this hatch is not to be missed! The weather can be interesting this time of year, but I can honestly say that some of my best days on dry flies have been during some snow flurry's! As snowflakes may be slightly blurring the incredible scenery around my favorite stream in Montana, the fish are crushing our skwalla patterns, and I'm sure of it again, "it's my favorite time of the year!" The two smaller stone flies of our area, capnia (little snow stone) and the nemora are also present. The "little snow stone" has meager importance to the trout, at only a size 18, but the fluttering of the size 16 to 14 nemora can attract the attention of some very nice fish. There are certain days when these can actually out-fish our favorite skwalla pattern. Don't worry, we tie plenty of these to! 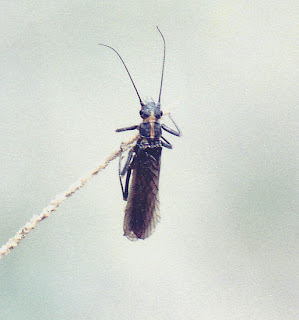 We also have some of our most unique mayfly activity of the year during skwalla season as well. 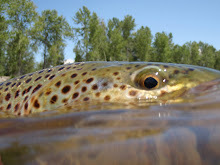 The Gray drake and Western March Browns are a healthy size 12 to 14 mayfly that gets the trouts attention in a hurry. One species actually crawls/ swims to the bank, to emerge near the shore, and on the rocks bordering the stream- "like a stone fly". The other makes a little more flashy entrance on to the waters surface by emerging underneath, and rocketing to through the meniscus like a caddis. The trout we catch during this emergence deliver an explosive take that gets the heart racing, and the line tight! We also begin to see some of our ephemerellas during the same time frame. Blue Wing Olives can coat the waters surface, and these familiar little sailboats offer the dry fly enthusiast a chance to catch very large trout on #16 and #18 patterns. The "Mother's Day Caddis" usually makes it's first appearance on our streams around the middle of the third week in April, and the overlapping of all our spring hatches is complete! This is usually about a size 16 that sports a grayish body, and dark gray wings. The females may display an almost chartreuse egg sack, but closer to, (you guessed it!) caddis green. The feeding frenzy's of spring will simply obliterate any lingering effects of cabin fever, and I highly recommend this season to anybody that may be getting the symptoms!!! Mention this BLOG, and you are eligible to receive $100 off the regular trip price, per day, on full day float trips, for any trip booked with Double Up Outfitters in the months of March and April!!! Sounds crazy? Yeah, probably, but we are confident that after fishing this hatch with us, you'll be back!!! Don't miss out on the chance for some of the best fishing of the season, and this "crazy" deal!